Burnley boss Sean Dyche believes teenage winger Dwight McNeil will only get better as he continues to grow and mature at Turf Moor. The 19-year-old had a hand in the home side’s opener against Wolves at the weekend and went on to score the second with a sweet left-footed strike in the 77th minute. That was McNeil’s third goal of the season, adding to the four assists he’s notched up since his first Premier League start for the club against West Ham in December. “It’s his first half-a-season but he’s going very well,” said Dyche. “Myself and my staff were looking at him earlier on in the season and it was the timing of it. “I thought the freshness of a young player, when I changed it, he’s definitely played his part in how we’ve started to turn things around. “He played his part in a very important game today. That capped a whirlwind week for McNeil who, having netted against Leicester City before the international break, represented England’s Under-20s in games against Poland and Portugal. The former Manchester United youth player was also handed a surprise invite to join the senior side’s training session at St George’s Park by Gareth Southgate. Dyche said: “It’s been a really good week for him. He got a little taste with Gareth [Southgate] and his lads while with the Under-20s and he’s come back and got an assist and a goal. I’m really pleased for him. 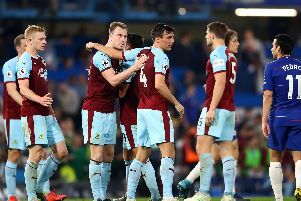 Dyche also extended his gratitude to his defence after limiting Wolves to just one shot on target. Despite owning 63% of possession, Tom Heaton’s only save of note came from a Jonny header in the second half. “I’m really pleased,” he said. “I’m always picky with centre-halves and they always look at me because I was one. “I thought we got a little bit deep in the second half but although they had the play, and they’ve got some good players, they never really got in to any good situations.